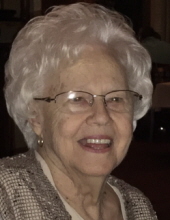 Mrs. Betty Walsh Livingston, age 82 of Boomer passed away Monday, November 26, 2018 at Caldwell Hospice and Palliative Care in Lenoir. Funeral services will be held at 1:00 PM Thursday, November 29, 2018 at Zion Hill Baptist Church with Rev. Tim DeBord and Rev. Robert Livingston officiating. Burial will be in the church cemetery. The family will receive friends from 5:30 until 7:30 PM Wednesday evening at Reins-Sturdivant Funeral Home. Mrs. Livingston was born March 9, 1936 in Wilkes County to Claude C. and Ruby L. Hamby Walsh. She was a member of Zion Hill Baptist Church. She loved decorating, putting puzzles together, she was very outgoing, and she never met a stranger. In addition to her parents, she was preceded in death by three sisters; Annie Mae Earp, Margaret Brookshire, Hallie Barlowe and one brother; Horace Walsh. She is survived by her husband; Roy Allen Livingston of the home, one daughter; Teresa L. Foster and husband Kenneth of Wilkesboro, one son; Eric Allen Livingston and wife Lisa of Davidson, two granddaughters; Catherine and Caroline Livingston and several nieces, nephews and great nieces and great nephews. Flowers will be accepted or memorials may be made to Caldwell Hospice and Palliative Care, 902 Kirkwood St., NW, Lenoir, NC 28645. To send flowers or a remembrance gift to the family of Betty Walsh Livingston, please visit our Tribute Store. "Email Address" would like to share the life celebration of Betty Walsh Livingston. Click on the "link" to go to share a favorite memory or leave a condolence message for the family.